In addition the 10th British ARDF Championships will be contested. 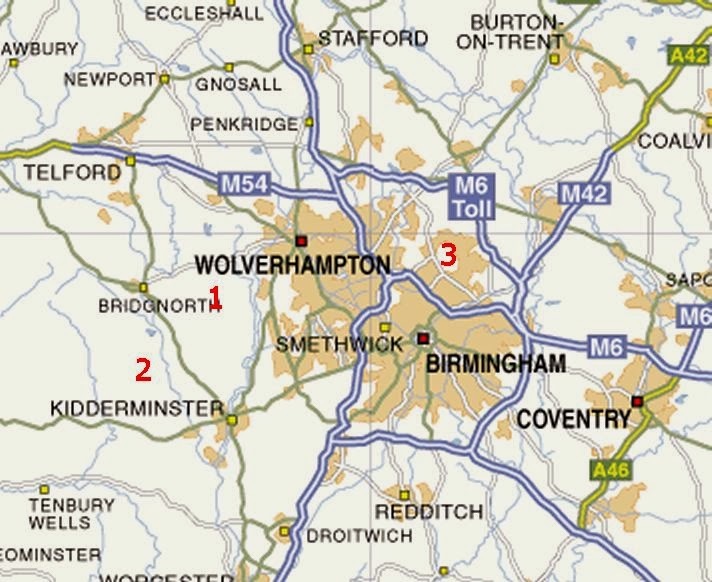 The events will be located in the West Midlands, close to Birmingham and East Midlands Airports. Given Name, Family Name, Callsign, Club/Association, Country, SI Chip Number or "hire" If you wish to borrow a chip for the event, class entered and days entered. If you wish to borrow receivers - either 2m or 80m - please let us know now - we have a limited number of each. Entry fees will be collected on the morning of the competition. Sutton Park, Birmingham: Very fast indeed - I can orienteer round here at under 6mpk and I am an M50. It may possible to get to the Friday and Saturday venues by public transport - a bit of walking or cycling will be necessary however. Use the UK Transport Planner to check out possibilities. On Saturday you could travel by steam train (Severn Valley Railway) - but they have special events on 10th and you would need to book ahead. Given prior notice we may be able to organise transport to and from the competition forests to local hotels or rail/bus stations. This is not guaranteed. Please contact the organiser to discuss well in advance of the event. As is standard GB practice competitors will be responsible for their own accomodation arrangements. There are plenty of hotels! Chains such as PREMIER INN, TRAVELODGE offer good deals if you book early. Bewdley and Kidderminster are the best places to stay if you are an overseas visitor. You will also find caravan and camping sites close by. This year we may have to pay to use two of the areas (these belong to the government and are free open access but there is a charge for organised activities) and make a donation to the local nature trust. Entry fees will be payable, in Cash (GBP) and in full upon arrival at Day 1 registration. There will be a reduced price for Junior competitors - to be confirmed. Given Name, Family Name, Callsign, Club/Association, Country, SI Chip Number or "hire" if you wish to borrow a chip for the event, class entered and days entered. If you wish to borrow receivers - either 2m or 80m - please let us know now - we have a limited number of each. The weather in May can vary between 25 degrees, dead calm and sun (hooray!) and 6 degrees, rain, sleet, hail and gale force winds (boo!). Please note will be a meal not a hamfest - no need to dress up! Please remember to tip your waitress - my cousin, Bethan. In the case of cancellation or curtailment of the competition the organisers accept no liability for competitors personal committed or incurred costs. We reserve the right to retain all or part of any entry fee or other monies paid to cover organisers costs, in the case where these costs cannot be recovered. Please send an email - to enter, register your interest and to ask any questions that you may have.